Description - Stain resistant and odorless, Solid Tiles w/ Raised Squares are a low profile tile that can withstand the harshest environments. Resistant to oil, grease, anti-freeze and household chemicals, these tiles are able to withstand the rollover weight of any standard vehicle. Easy to install and maintain, these interlocking modular tiles feature a raised square pattern, providing added traction and slip resistance. Backed by a lifetime warranty, feel free to mix and match these tiles with TechFloor versions to create custom looks and designs. Material – Tiles are constructed of high quality impact resistant polypropylene (extremely durable hard thermoplastic polymer). Recommended Uses – Solid Tiles w/ Raised Squares can be used in both wet or dry environments and can be commonly found in garages. These tiles have also been used in basements, laundry rooms, man caves, trade shows, dealership show rooms, as commercial flooring and much more. Combine with any TechFloor tiles. How do you clean the floors after a snowy winter. Can water be applied for cleaning without doing any damage to the floor or concrete? To clean our Solid Tiles w/ Raised Squares we recommend the use of a hose and a broom. The broom will help to remove any large debris and dirt, and the hose helps to remove any stuck on dirt, mud and stains. How do you end the floor at the garage door? Do you have a piece of trim that the garage door sits on or in that runs the width of the garage? 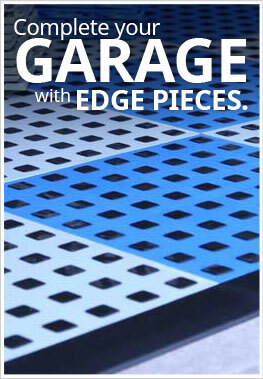 Techfloor's Solid Tiles w/ Raised Squares have edging that can be added to the entrance of your garage. We offer both male and female edging. You can find these edges on the product page in the accessories section. Excellent look and fairly easy installation. You definitly need a rubber mallet to install. I purchased the dark grey tiles with the embossed squares. I put down landscaping fabric under the tiles as suggested by another consumer. It was the correct thing to do because it is much quieter. I also installed the beveled edges and front row of tiles first so I could make sure the front was straight and in the correct location. I staggered the beveled strips so each would attach to two tiles hoping it would strengthen the first row. Individual one foot tile is a bit much to install...I needed 390 tiles. Would be nice if they came in 2x2 size. Do yourself a big favor and get knee pads! All in all it is a good product with a great look. I am very satisfied. Excellent product. I enjoyed laying it down myself. The advisor I had for the purchase was Andrew. He was very knowledgeable and helpful. He answered all my questions with his expertise.I wound up with an extra box of tiles which the company agreed to take back and provide me with credit. Very good overall experience.